The industrial hygiene and air quality professionals at Clark Seif Clark work to identify and mitigate potential respirable and occupational hazards. As with any emission generating activity, without the appropriate isolation and/or ventilation, concentrations of emissions have the potential to become significant and to result in air quality concerns for operators and/or bystanders. Due to their initial high cost, corporate research laboratories and major universities were some of the earliest adopters of three-dimensional (3D) printing technologies. In recent years, 3D printers have become increasingly popular as the cost to own and operate these devices has dropped dramatically. Today, 3D printers can be purchased for only a few hundred to several thousand dollars. Consequently, these items can now be found in many businesses, factory floors, colleges, high schools and even people’s homes. 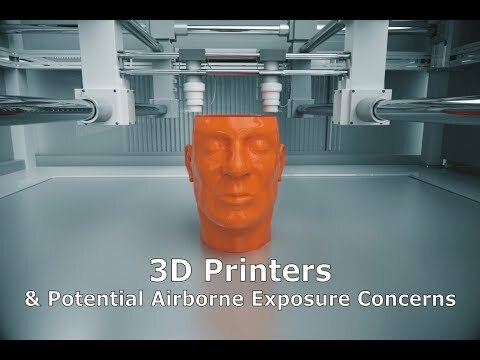 The vast majority of people who utilize 3D printers likely have no idea they could be exposing themselves and others nearby to potential respirable pollutants. Much of the concern is due to exposure concerns associated with nanoparticles and volatile organic compounds (VOCs) released by these machines. Recently, some universities have taken notice of these concerns. For example, the University of Florida has a published a 3D Printer Policy and the University of Vermont provides students and faculty with online 3D Printer Safety information. Documents such as these typically provide information about ventilation requirements, personal protective equipment and special training for 3D printer users.